Acronis True Image is a powerful disk imaging software that creates backups and recovers PC systems.Unfortunately this software is not free.However Acronis has an agreement with Seagate and Western Digital and provides a re-branded version of Acronis True Image completely free. 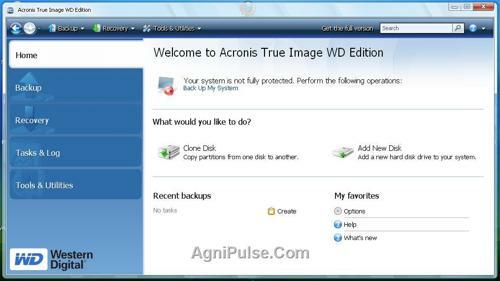 This rebranded version of Acronis True Image comes in 3 versions.DiscWizard for Seagate Users, MaxBlast for Maxtor users and Acronis True Image WD Edition for Western Digital users. 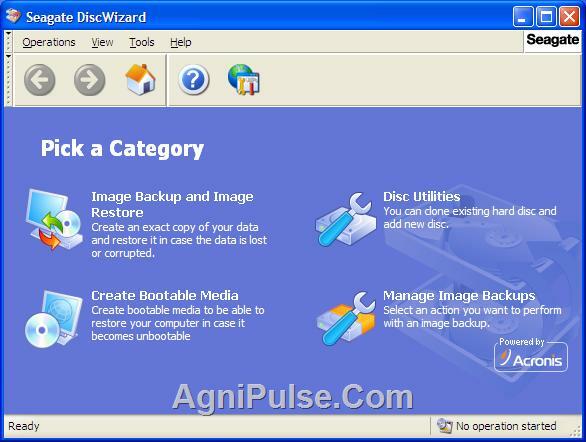 Each of these versions work only with the respective products.For example Acronis True Image WD Edition works only in computers having Western Digital Hard Disks and Seagate Disc Wizard works only in computers having Seagate Hard Disks. NOTE:If you don’t know which Hard Disk you have, then follow these steps. Click on the plus sign next to Disk Drive.It will expand and you can alphanumeric string.If this string starts with ST then you have a Seagate Hard Disk.So download Seagate DiscWizard.If it starts with WD then it is a Western Digital Hard Disk.So you have to download Acronis True Image WD Edition. This edition also contains Acronis Drive Cleanser which securely delete data on your Western Digital hard disk. The bootable media builder can either directly write to your CD writer or can create an iso file.The iso file created is about 81.3MB and contains all the above mentioned features. Using powerful imaging technology, Seagate DiscWizard lets you create image backups of all the data on your computer, entire discs or individual partitions. The unique technology developed by Acronis and implemented in Seagate DiscWizard allows you to create exact, sector-by-sector disc backups, including all operating systems, applications and configuration files, software updates, personal settings and all of your data. If failures occur that block access to information or affect system operation, or if you accidentally delete necessary files, you’ll be able to use the image backup to easily restore the system and lost data. The bootable media builder creates a bootable iso of 61MB. Unfortunately I do not have a Maxtor Hard Drive and I was unable to test it.Anyway here is the download link . Just a sitenote. Seagate bought Maxtor and both Seagate DiscWizard and Maxtor MaxBlast should both work with Seagate and Maxtor HDDs. I have THREE Seagate HDs in my box, but the Main (system) CD is failing, nearer death than Keith Richards, So obviously I don’t want to install a cloning prog on that HD, or even have Windows run, since that might well use up the last usable moments of my C: drive. Running from the ISO-burnt CD would be fine, but I can’t download the ISO file (or run the DiscWizard prog since I’m doing this doing this from a laptop which has no Seagate drive. Now, after using Seagate drives EXCLUSIVELY (apart from this old laptop), since 1992, and swearing loyalty to them to all who asked, WHY CAN’T I GET A RESCUE TOOL to save the first-ever Seagate HD that has gone arseways on me? Eh? Huh? I used to be a real advocate o SG, but their user service has to be classified as totally cuntacious. if you hold down Alt, and press T, then O, and then click okay, you can bypass the brand check.